Stampin' Up! Bermuda Bay 3/8" Mini Chevron Ribbon from the 2017 Annual Catalog. Top Rated SellerFrom United StatesBrand: Stampin' Up!Width: 3/8"
Stampin' Up! Real Red 3/8" Cotton Ribbon - 5 yds. EARLY ESPRESSO TAFFETA RIBBON, 3/8" WIDE, 10 YARDS.DON'T MISS OUT ON THIS AMAZING DEAL! From United StatesBrand: Stampin' Up!Width: 3/8"
Color: Tangelo Twist. 4 stitched rows. 3 yards So Saffron 3/8" - flower print; one-sided. 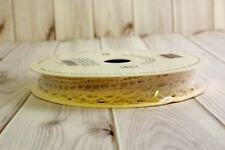 3 yards Whisper White 3/8" - Lace-like trim; one-sided. 3 yards Riding Hood Red 5/8" - Grosgrain; double-sided. Retired! Stampin' Up! Ribbon Spools! Your choice of color! Worldwide Shipping! Stampin’ Up! 3/8” Venetian Crochet Trim. (retired) Stampin' Up! Riding Hood Red - Pleated Satin Ribbon. Five spools in the following colors: brown with pink flowers, apricot, white and celery green. 3/8" brown floral ribbon 3 yards, 1/4"w gross grain ribbon in apricot & celery green 25 yards, 3/8"w white gross grain ribbon 55 ft, and white satin ribbon 1/8"w 10 yards. (retired) Stampin' Up! Raspberry Ripple - Satin Stitched Ribbon. 3/8" - 10 Yards. Whisper White - Taffeta Ribbon. (retired) Stampin' Up! 3/8" - 10 Yards. (retired) Stampin' Up! Baja Breeze - Pleated Satin Ribbon. Stampin' Up Raspberry Ripple Ribbon. Condition is New. Shipped with USPS First Class Package. Stampin’ Up! This ribbon was part of the 2017 Sale-A-Bration promotion, is retired and is no longer available.